This post is sponsored by Ragú. 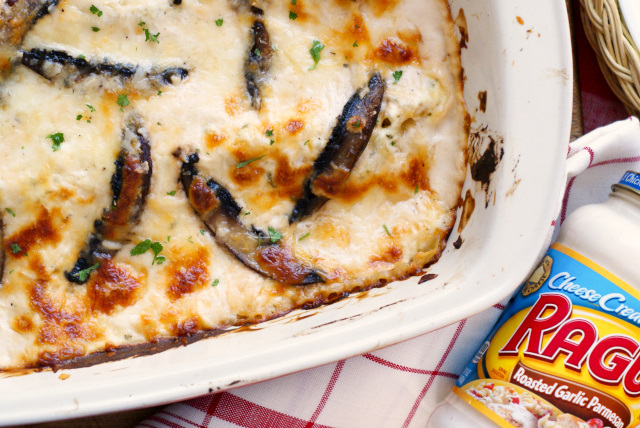 Five Cheese Mushroom Lasagna is a cheesy comfort food casserole made with five varieties of cheese and Ragú Pasta Sauce. If you could take a snapshot of my family's meals from when I was a kid, you would think we were Italian considering how often we ate Italian food...even on holidays! A hearty Italian casserole is a staple for Christmas dinner and a tradition that has been passed down in my family. The best part? Everyone takes their own spin on it! My great-Aunt was known to make lasagna and my Momma always prepared amazing stuffed shells. Don't you just love family traditions? I do. I mean, my whole blog is a tribute to a family tradition that helped spark my love for all things food. Traditions are intensely personal and make us who we are. They help us learn about ourselves and connect us across generations. That's why I've chosen to carry on the tradition of a holiday Italian casserole! When I was asked if I would like to use Ragú Pasta Sauce in my recipe tradition, I said yes right away! I am inspired by the story of Ragu's founder, Assunta Cantisano. She was an immigrant from Italy with an entrepreneurial spirit. Assunta came to America as a single mom with a little something extra up her sleeve, her family’s recipe for tomato sauce! It was the time of the Great Depression, and in a time when people expected less, she gave them more. With her dream and her high standards, her recipe literally became the recipe for her success and Ragú pasta sauce was born! Made with farm grown ingredients, no artificial flavors, and no high fructose corn syrup, Ragú is a sauce to be celebrated and to be used to make your own traditions! It is crafted with passion and simmered in tradition. To carry on my family's Italian casserole tradition, naturally I decided to make my dish extra, extra cheesy. I am a serious cheese lover, so it only seemed right. I used five varieties of cheese, to be exact. Five glorious cheeses. Definitely a spin on the tradition and so, so good! 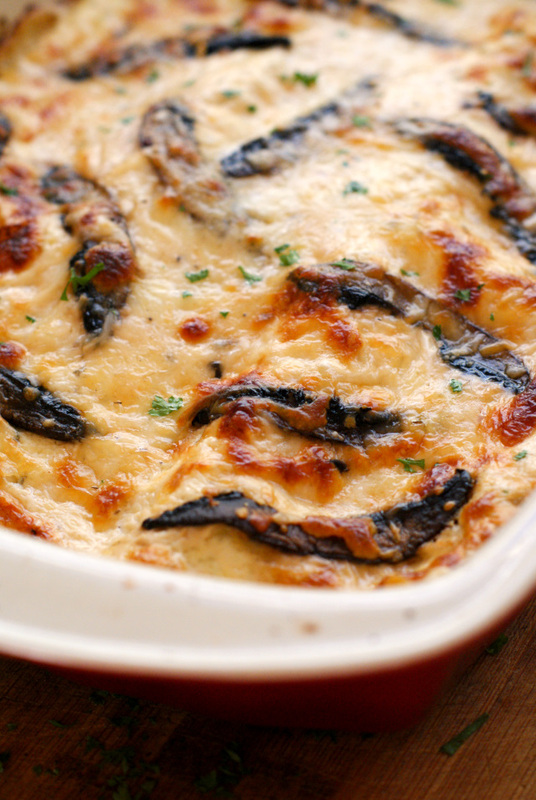 And because my mushroom obsession is alive and well, I decided to make my dish a fabulous Mushroom Lasagna using Ragú's Roasted Garlic Parmesan Sauce. The result was rich and delish, and I love that I am carrying on my family's tradition. Do you have any holiday meal traditions? Perhaps you can bring a bit of Assunta’s spirit to your own home and start a new tradition this year! 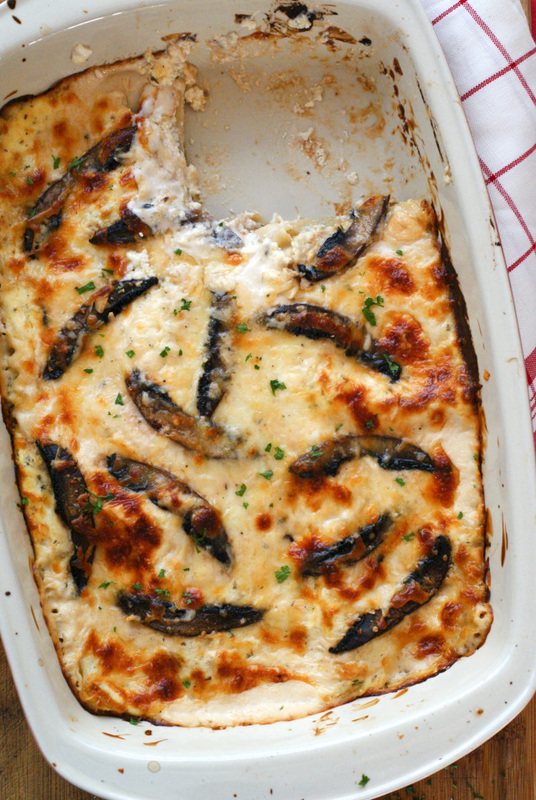 Naturally, I suggest this Mushroom Lasagna. I hope you love it! Preheat your oven to 375 degrees. Cook lasagna noodles according to the package directions. Meanwhile, heat 1 Tbsp of the olive oil and 1 Tbsp of the butter in a saute pan over medium-high heat. Add half of the mushrooms to the pan, season with salt and pepper, and cook for 4-5 minutes flipping once. Remove from the pan and repeat with the remaining olive oil, butter, and mushrooms. In a bowl, mix together the ricotta, egg, pecorino romano cheese, oregano, basil, parsley, and pepper. In another bowl, mix together the shredded mozzarella, asiago, and parmesan cheeses. Spread 1/2 cup of the sauce into the bottom of a 9 x 13 glass baking dish. Place three noodles into the dish, top with 1/3 of the ricotta mixture, 1/3 of the mushrooms, 1/3 of the cheese, and 1/2 cup of sauce. Repeat with three more noodles, 1/3 of the ricotta mixture, 1/3 of the mushrooms, 1/3 of the cheese, and 1/2 cup sauce. Finish the last layer with three more noodles, 1/3 of the ricotta mixture, followed by the remaining sauce, the remaining mushrooms, and the remaining cheese. Bake uncovered for 35 minutes. Let sit 10 minutes before serving. 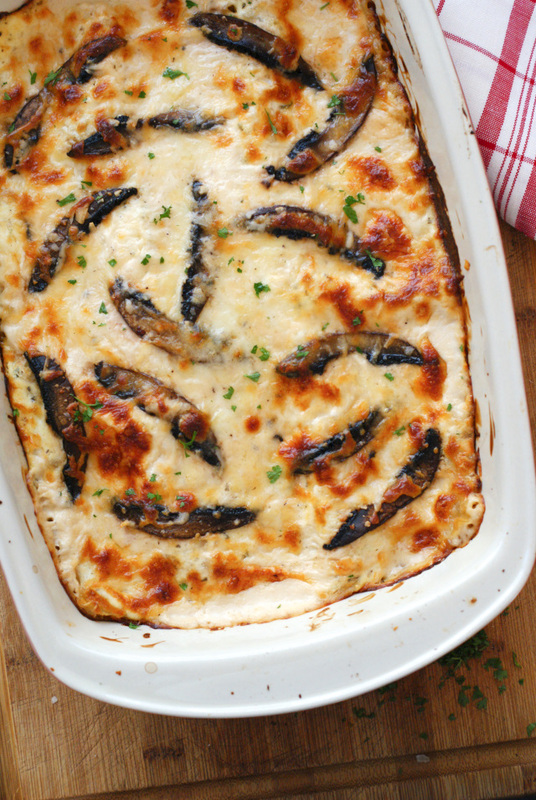 OMG I love mushrooms and this looks amazing, I can't wait to try it! It was so good! It's my new fave and you're right...so easy!